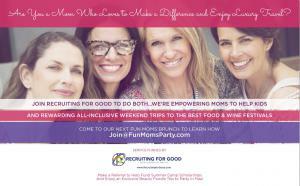 SANTA MONICA, CA, UNITED STATES, November 8, 2018 /EINPresswire.com/ -- Recruiting for Good launched L.A's Funnest cause 'helping moms fund summer camp.' The staffing agency will reward referrals made by moms that lead to someone getting hired; with donations to help fund summer camp scholarships and Fun Moms Party Trips to Maui's Best Food and Wine Festival in June 2019, Cayman Island Cookout in January 2020, and Aspen Food and Wine Classic in June 2020. Carlos Cymerman adds, "We love to collaborate with moms who want to experience their own girlfriends' (group) getaway to party at the best food and wine festivals. Join Recruiting for Good today to help kids enjoy camp....and have the time of your life." Our Moms Work is a Santa Monica based community service sponsored by Recruiting for Good; offering cost free personal career mentoring services. Our fun mission..."When we love life...the party never ends." www.OurMomsWork.org. Starting in 2019, one more fun way we help moms Fund Summer Camp.